Peter Julian Eymard was born on February 4, 1811 in La Mure, France. He grew up in a poor family after the French Revolution, at a time when Catholicism was not looked upon kindly. that you have come to dwell in my heart. It was clear from an early age that Peter wanted to be a priest, although his father was not happy with that idea. After he entered the seminary, illness forced him to leave. But he persisted and was finally ordained for the Diocese of Grenoble when he was 23. A few years later he heard some Marist Priests preach. The Marist order is dedicated to Mary, the Blessed Mother. Their message appealed to Father Eymard, and he eventually joined their congregation. He traveled through Europe, giving retreats and missions. As time passed, he felt very drawn to Jesus through the Eucharist and decided that there needed to be priests who urged devision to this. In 1856, Father Eymard founded the Congregation of the Blessed Sacrament. The men who joined the congregation guarded the Blessed Sacrament 24 hours a day and soon attracted lay persons to do the same. 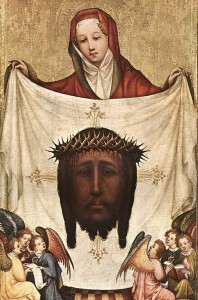 This practice of prayer and devotion before the Blessed Sacrament became known as Eucharistic devotion. The congregation struggled and was very poor. But Father Eymard did not give up. Despite continuing problems with his health, he even helped form the Sister Servants of the Blessed Sacrament with one of the women who came to him for direction, Marguerite Guillot. Along with the men and women of these congregations, he visited the poor and those in prison, and he tried to educate Catholics in the teachings of the faith. 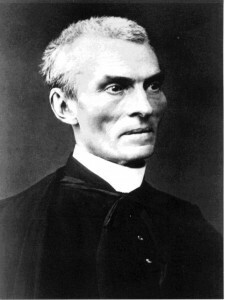 In 1868, at the age of 57, Father Eymard died. 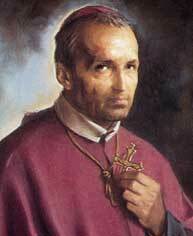 He was canonized 1962 by Pope John XXIII. He has been referred to as "the Apostle of the Eucharist."